Worldwide Rx Sales Forecast to Grow 6.3% p.a. to 2020. The nineth edition of the EvaluatePharma World Preview 2016, Outlook to 2022 report brings together many of our analyses to provide a top level insight, from the world's financial market, into the expected performance of the industry between now and 2022. The combination of increasingly vocal politicians railing against US drug pricing, a weak global recovery, uncertainties created by Brexit, and the outcome of the US presidential race all create uncertainty for investors. However, for those willing to take a longer-term view, the outlook is nuanced, with a projected annual compounded growth of 6.3 percent in global prescription sales over the next six years. Worldwide prescription drug sales predicted to grow 6.3 percent (CAGR) between 2016 and 2022. $169 billion in additional prescription drug sales in 2022 to come from R&D projects. Novartis and Roche to compete head-to-head for the title of worldwide prescription drug sales in 2022; Pfizer to challenge them following the Medivation acquisition. Worldwide pharmaceutical R&D spend expected to grow by 2.8 percent (CAGR) to $182 billion in 2022. Celgene and Shire forecast to record the fastest sales growth (CAGR) by 2022 with increases of 16 percent and 19 percent, respectively. Oncology remains the largest therapy area in sales with a 12.5 percent (CAGR) growth rate from 2016 to 2022. 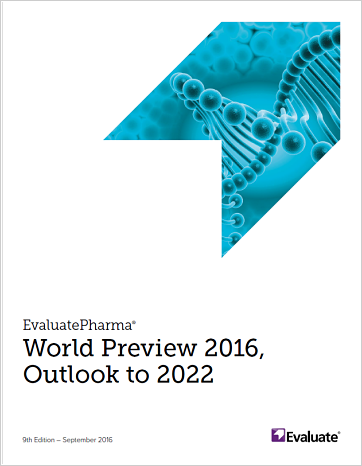 The ninth edition of the EvaluatePharma World Preview 2016, Outlook to 2022 report brings together many of our analyses to provide a top level insight, from the world's financial markets, into the expected performance of the industry between now and 2022. New this year - Worldwide Pharma Innovation 2008-2022 including insights into the companies with most valuable pipelines based on NPV analysis. Worldwide prescription drug sales predicted to grow 6.3% (CAGR) between 2016 and 2022. Worldwide pharmaceutical R&D spend expected to grow by 2.8% (CAGR) to $182 billion in 2022. Celgene and Shire forecast to record the fastest sales growth (CAGR) by 2022 with increases of 16% and 19%, respectively. Oncology remains the largest therapy area in sales with a 12.5% (CAGR) growth rate from 2016 to 2022. What is your therapy area(s) focus?